Mini photo sessions are designed with your family in mind. Becky will have your family in and out, in less than 20-minutes! That means you don’t have to sit and wait while your kiddos get antsy. All you have to do is come in and smile. How it works: Each session is 15-minutes long and is designed to give you 4-6 pictures. Each session includes one 5x7 inch spring-themed postcard with your two favorite images. 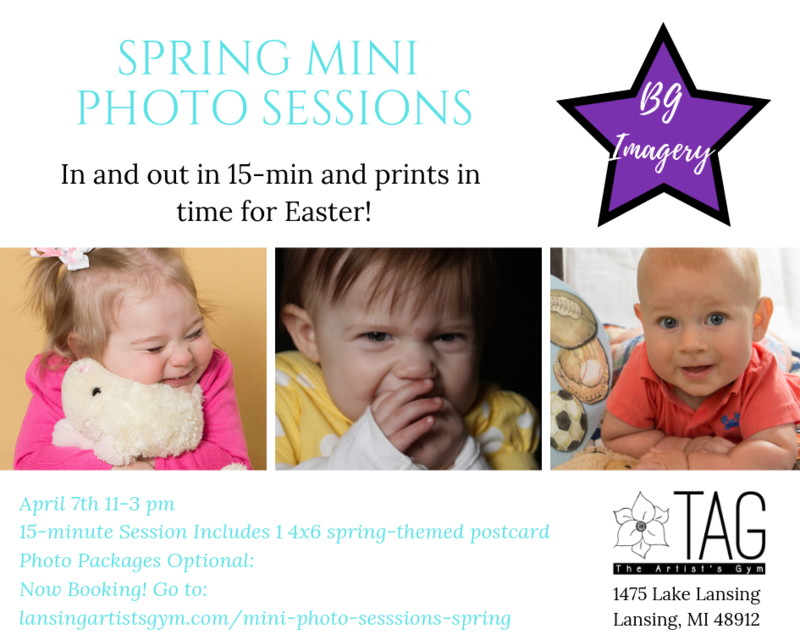 Pictures will be available for pickup at The Artist’s Gym by appointment April 14-20th. A La Carte: with the purchase of one of the following packages, all additional poses are $25 and include your choice of 1 8×10 or 2 5×7 images. Digital download of all poses with the rights to print. Due to the short time frame and limited number spots, all session fees are non-refundable. If you are late for your appointment, we will not hold your spot. Please arrive a few minutes early to ensure you are ready to go at your scheduled time.